Since the adoption of the PA in 2015, 197 countries have signed on and are now embarking upon a to develop a rulebook for its implementation. The process includes a meeting of the parties of UNFCCC at the Conference of the Parties (COP) annually in November or December, with each led by a different president. The most recent COP (COP23) was held in 2017 with Fiji (represented by Prime Minister Frank Bainimarama) serving as the president. 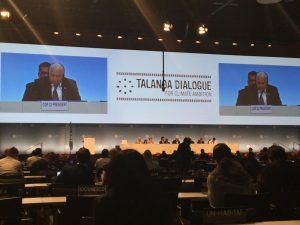 At this meeting, Prime Minister Bainimarama instituted a new means of negotiations to replace the facilitative dialogue process that had been in use: the Talanoa Dialogue process. Leading up to the annual COP meetings, the UNFCCC hosts at least one meeting typically held in the spring of the year in Bonn, Germany where the parties’ current mandate is to negotiate terms of the rulebook for implementation of the Paris Agreement. This pre-COP meeting is known as an intersessional meeting. 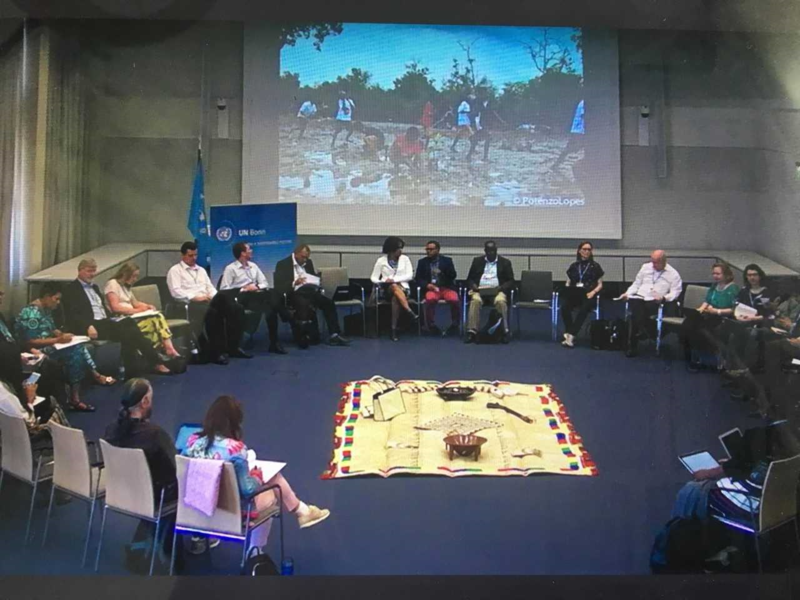 The intersessional meeting for COP24 was held from April 30 through May 10, 2018. The Talanoa Dialogue process was used for the first time at this intersessional meeting session. 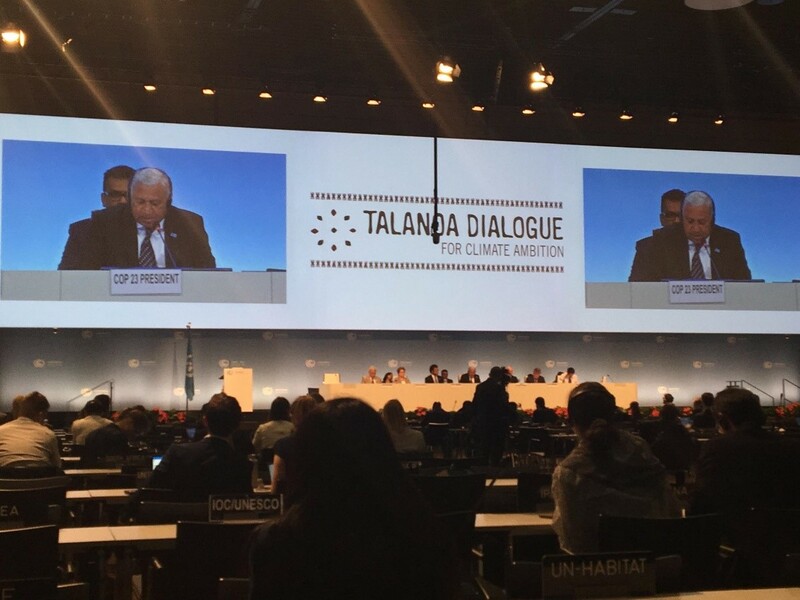 The Talanoa Dialogue closing plenary was held on May 9th, and featured opportunities for parties and non-parties to offer interventions. A few common themes resonated: appreciation to the Fiji COP23 presidency for implementing this form of discussion; asks for continuation of these types of dialogues through COP24 and beyond; clarification on how the Intergovernmental Panel on Climate Change’s (IPCC) report on 1.5o to be released in October of this year will be used in these discussions; and further discussion on how these technical discussions will be operationalized into a political path forward to shape ambition for addressing climate change. It was universally agreed that the Talanoa Dialogue provided a comfortable space for parties and non-parties to build trust and to share knowledge and experiences in a storytelling manner. Prime Minister Frank Bainimarama ended the plenary with his story. He stated that he took this job to make a difference because he was heavily influenced by Fiji’s experience of being hit with two cyclones this year in the span of 8 days. He made two pleas to those in the plenary on behalf of the people he had just visited a week earlier: (1) a call to action; and (2) to get the Paris rulebook done on time. It is truly a time to act on the environmental degradation caused by the warming planet as our calling to protect all of God’s creation. As the ELCA social statement “Caring for Creation: Vision, Hope and Justice” (1993) states, “Christian concern for the environment is shaped by the Word of God spoken in creation, the Love of God hanging on a cross, the Breath of God daily renewing the face of the earth.” (A Social Statement on: Caring for Creation: Vision, Hope, and Justice) The Talanoa Dialogue is one tool that allows us to carry out our work as stewards of God’s creation. 1 In June 2017, the United States gave notification of its intention to withdraw from the PA unless more favorable conditions can be negotiated. However, the PA process dictates that withdrawal will take at least three years.